Teenage years are synonymous for everyday emotional rollercoaster rides for both the teen and the whole family, and it’s also a time when your child’s bedroom can easily become a No Access area for adults in the house. Nevertheless, however willful, rebellious, and moody your teenager can be, they will still need a snug nest to withdraw to every night, which means that you – as their parent – need to invest a tad more effort (and nerves) in planning your teen’s bedroom décor. 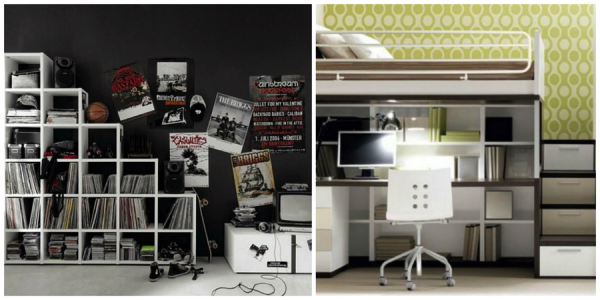 So, how exactly can you put together a teen bedroom that will suit both your child’s and your own design bill? 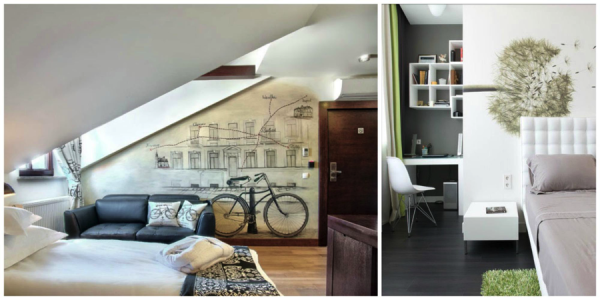 Kids grow, and their bedrooms have to follow suit, at least in terms of functional versatility. Your teen will need multipurpose space that can double both as a place where they can handle their homework and as an entertainment area, which can be a tough task for a parent whose home is not exactly generous, size-wise. Still, the fact that your teen’s bedroom is on the smallish side shouldn’t mean they can’t invite friends over for a chat: consider the layout and see whether and where you can tweak it to usher in an extra dose of functionality. Open-back shelving, heavy drapes, and area rugs can be used to separate study space from the sleeping and lounging area. The room color scheme is another simple way to create separate zones for different purposes: a pastel wall and desk will make a perfect study backdrop, while artwork and modern sectionals will make a great lounging nook for your teen’s get-together with friends. With the bedroom layout in check, it’s time to turn attention to all the gear your child has stored in their burrow. Teenagers usually have more clothes than they can ever pack in a tiny closet, so it may be a wise move to hire a professional carpenter to transform a blank wall into a walk-in wardrobe, or at least upgrade storage capacities in the kid’s bedroom. Custom fitted wardrobes are an excellent option for small teen rooms, as they promise a convenient storage update that fits both the room dimensions and the parent’s budget. A tall mirror installed on the inside of the wardrobe door is another invaluable space saver: teens are extremely sensitive when it comes to their styling, and they will definitely appreciate a chance to spend a few spare hours trying on different getup combinations. As far as design is concerned, most teenagers look favorably on mix-and-match décor so they won’t mind if you do the family budget a small favor and stack their nests with furnishings and extras belonging to different styles. Take your teen to an antiques store or a garage sale, and pick cool stuff together: that way, you’ll avoid the risk of complaints about the bedroom looking dull or excessively flashy. You should also consult your teen about the wall color: yes, they’ll put up posters all over the place, but the room still needs to be in line with their tonal preferences. As far as sleeping area is concerned, your child will need all the comfort money can buy so opt for a comfy latex mattress and memory foam pillows. Cash spent on ergonomic furniture will be an investment in your child’s long-term health, so don’t skimp on it because your teen deserves to get a good night’s sleep every time they hit the sack. The fact that a subdued color scheme works for you doesn’t mean that your teen will be thrilled by it. Let your teenager go personal with the choice of carpeting, accessories, and decorations: after all, it’s their space, and they should have the final say in the décor. 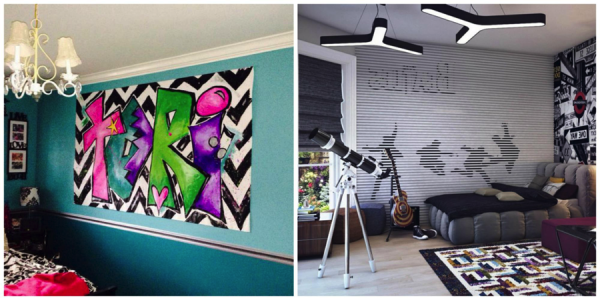 A graffiti board, decal, or accent wall will provide a blank canvas for your teen’s creative expression, and they can also pick lighting and upholstery fabrics in line with their personal décor flair. To win extra parenting points with your teen princess, consider updating her sleeping area with a canopy bed, and let your son choose the tech for his room on his own. Working together with your teen on their bedroom décor will allow you to bond and have fun together, and it’ll show them you respect their views and design desires. Don’t be another dull grownup who doesn’t understand anything: tend to your teen’s bedroom design with care and appreciation for their personal preferences, and you’ll win the title of the coolest parent ever in a blink of an eye. Still, don’t let your teenager transform your joint design project into a landfill: drop in from time to time and see that their snug nest is clean and orderly, and take care of repairs and updates with due care. Good luck!